That caring philosophy extends beyond the horse corral to almost every facet of life at The Hacienda. Located at the base of the Catalina Foothills, within a stone’s throw of the Rillito River, the sprawling Spanish-style facility is peppered with native plants, picturesque gardens and soothing green spaces. Baby hummingbirds quietly nest within the branches of a tree near a burbling fountain. It feels more like a desert-bound luxury getaway than an independent living, assisted living and memory care community. But thanks to a partnership with the University of Arizona College of Nursing and its one-of-a-kind Integrative Nursing Faculty Fellowship (INFF), the Hacienda will be a unique environment where nurse faculty can practice and nurse students can learn relationship-centered, whole-person care that inspires optimal health and wellbeing – person and environment synergy at its max. In addition to the equine therapy program, other integrative therapies offered at The Hacienda include aromatherapy, reflexology, acupressure and acupuncture. Horticultural therapeutic programming will also be featured at some of The Hacienda’s green spaces, and aquatic therapies and swimming will be presented at the therapy pool. All of it is geared toward encouraging a personal wellbeing for residents that resonates physically, spiritually and emotionally. The attention to detail benefits the day-to-day wellbeing of the residents, but it’s also part of a larger research initiative that draws on the College’s integrative health expertise. Thanks to the early planning by Dr. Mary Koithan, UA College of Nursing associate dean for student support and community engagement, The Hacienda’s facilities will be a ‘living laboratory’ for the College of Nursing. “It was essential that we bring in students so they can learn what it really means to take care of someone in an integrative way,” says Dr. Williams. INFF Fellows, bachelor of science in nursing (BSN), doctor of nursing practice (DNP), and PhD nursing students will rotate through the community. “Moreover, we intend to quench our thirst for new knowledge. We will be assessing how integrative care therapies affect the quality of life of the residents,” says Dr. Williams. “I’m really interested in propelling nursing science forward so we can say, ‘Look, these techniques do affect health in a positive way, and here’s the evidence behind it.’” A fellow in the first INFF, Williams incorporated the integrative knowledge she gained into the classes she teaches and was encouraged by student responses. She noted that after discussions of aromatherapy and acupressure, students developing care plans for patients broadened their toolkits. “Instead of immediately going to Tylenol, they would ask patients, ‘Are you willing to try this other approach?” she says. The benefits of integrative health techniques are manifold. For example, therapeutic equine therapy programs are increasingly recognized as a viable form of occupational therapy and rehabilitative care after injury and illness. 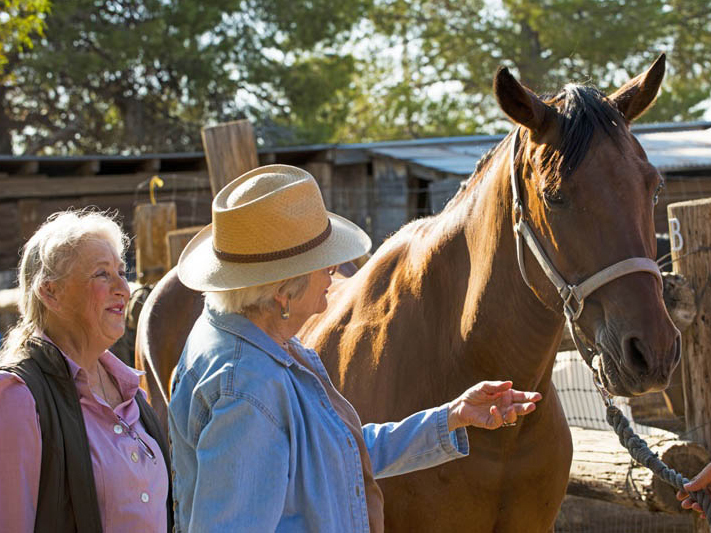 Evidence points to increased compassion, sense of purpose and confidence for seniors who interact with horses. Evidence from a recent research project measuring the heart rate of horses and the people interacting with them showed that the meditative heart rate of a horse at peace will actually sync with the person’s and calm their pulse. Gazing into the languid brown eyes of Joe and Prissy, two of the horses at The Hacienda, it’s easy to see why.